Libraries change lives. They are magical portals to worlds of wonder, replete with possibility, especially for poor, working class, black and ethnic minority people, they offer a hope of rising above the limiting circumstances of our birth. For the shy, isolated and excluded child, they offer companionship and a chance to rehearse bravery, for poor, working class, black and ethnic minority people the chance to meet their full potential. Libraries are more than a material resource; they are the commitment of our community to its future. They express a faith in the power of shared imagination. Lambeth Council, one of the poorest boroughs in the country, is stopping funding to half of the borough’s libraries. Two will be immediately sold off to cash in on the rising property prices locally. Others they hope will be taken over by fantasy big society community groups, or replaced by bookshelves in pubs. Threatening half the borough’s libraries with closure is a short-sighted and irresponsible plan, public libraries are an essential part of a functioning literate nation. This is an act of vandalism against the community, signalling the death of hope that anything can ever get better. 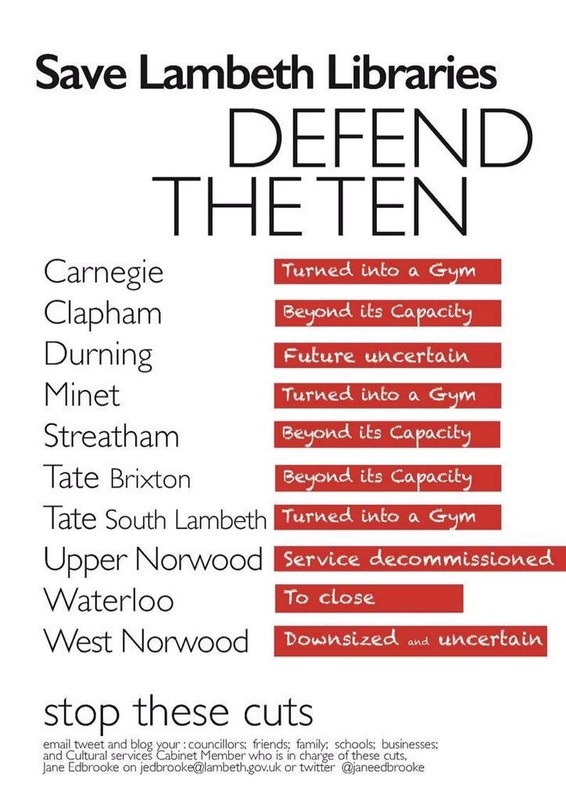 Less than TEN weeks to save the TEN! The plans put forward by Lambeth Council seek to close half our libraries. We are incredibly grateful to all of them for the support they have offered. Tags: books, closures, cuts, labour, lambeth, learning, libraries, literature, london, love libraries, lovelibraries, no cuts, nocuts, public services, reading, save libraries, savelibraries, uk, unison | Permalink.